Despite the growing popularity of gravel bikes, both winners, Janel Holcomb and Rob Squire, opted to go with cyclocross bikes for the Crusher. The all-around versatility of ’cross bikes has been documented once or twice on these pages, and the two winners showed challenging 4,000-foot descent down the Col d’Crush. Today, we take a look at Rob Squire’s winning bike, with some equipment choices that might surprise you. Stay tuned for a profile of Janel Holcomb’s winning Focus Mares. As both riders mentioned in interviews with CXM’s Zachary Schuster, they are ’cross-curious, and thus there is a good chance their gravel steeds will see some double duty on the cyclocross course this fall. You can provide ’cross encouragement to them via Twitter at @robthesquire and @janelholcomb. Who needs gravel bikes or tubeless gravel tires? Rob Squire’s bike of choice was a 55cm Felt F1x cyclocross. While the bike has taken Belgian star Wout van Aert to the top at Worlds, in Utah under Squire it proved to be an equally capable gravel bike. 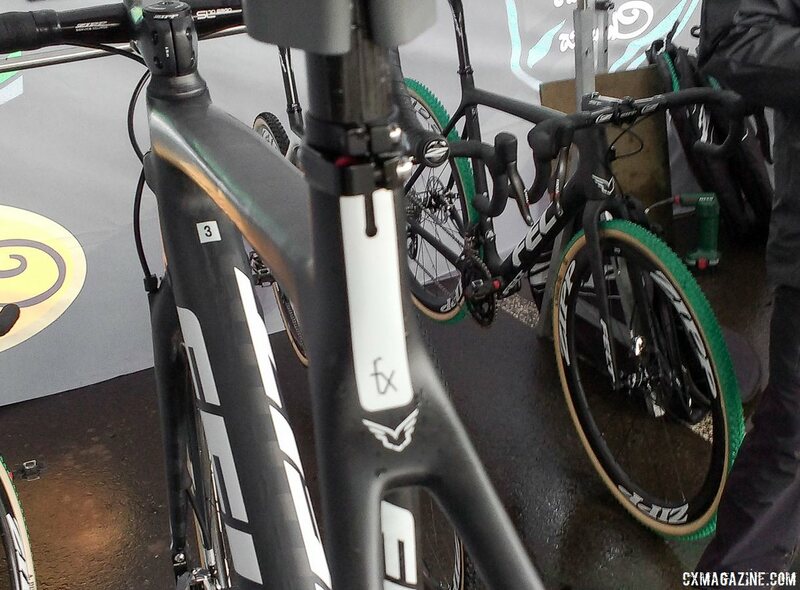 It’s not the first time we’ve seen a Felt F1x raced to prominence at a top gravel event. In 2015, a Felt F1x with just one gear was powered to sixth at the inaugural Lost and Found gravel race. Felt’s top-shelf F1x comes with two different builds, both with 1x drivetrains: A Dura-Ace Di2-equipped machine with both shifters enabled, and a SRAM Force 1 model. Squire rode the Di2 version, with some significant modifications. The Felt F1x carries cyclocross world champs like Wout van Aert and gravel crushers. 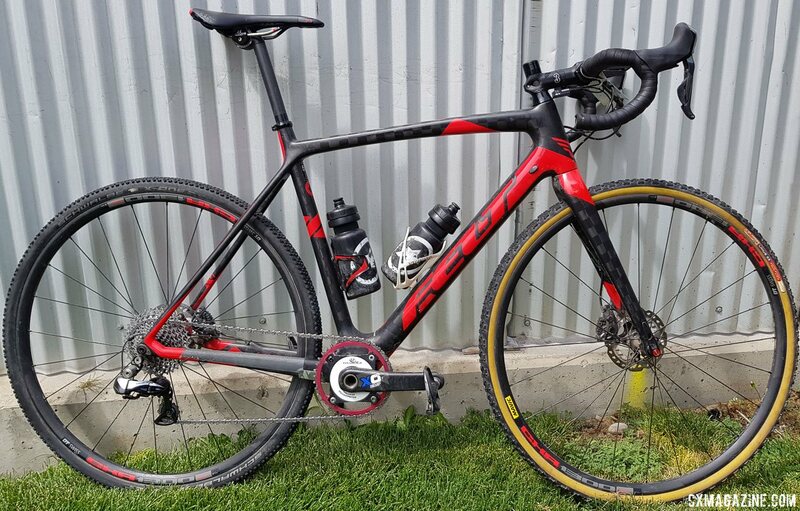 Rob Squire’s 2017 Crusher-Winning Felt F1X Di2 Cyclocross bike. Perhaps most noticeable is Squire’s crankset. He opted for the SRM-enabled Truvativ XO crankset, originally intended for dual chainring mountain bike use, but adapted for his gravel escapades. Rob Squire’s 2017 Crusher-Winning Felt F1X Di2 Cyclocross bike featured a Truvativ X0 mountain bike crankset, built for two chainrings, equipped with an SRM power meter, and set up with just one 40t chainring. 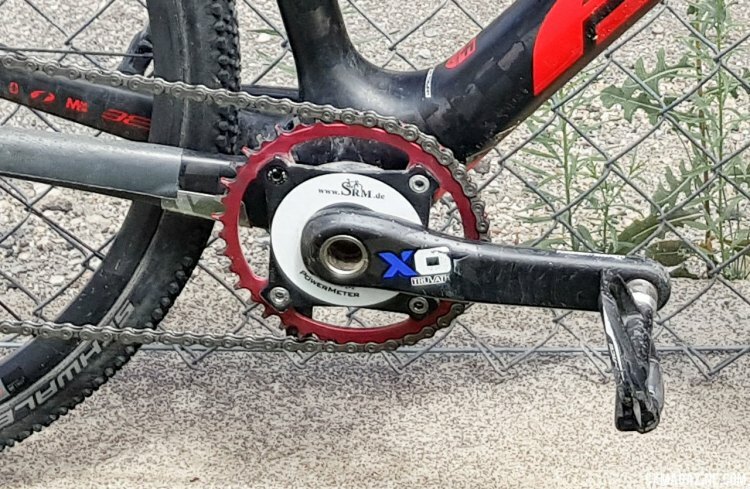 The 1x gearing set-up is the result of some Crusher trial and error. Squire said his first year he ran a 36T front chainring with an 11-28 rear cassette and found the gearing was not enough for the climb up the Col d’Crush. His 2017 bike featured a 40T front chainring and an 11-36 rear cassette to provide the extra climbing gear needed to crush the climbs. His 42cm handlebars were joined up front by a Wahoo Bolt computer to keep track of the watts and/or miles of climbing left. 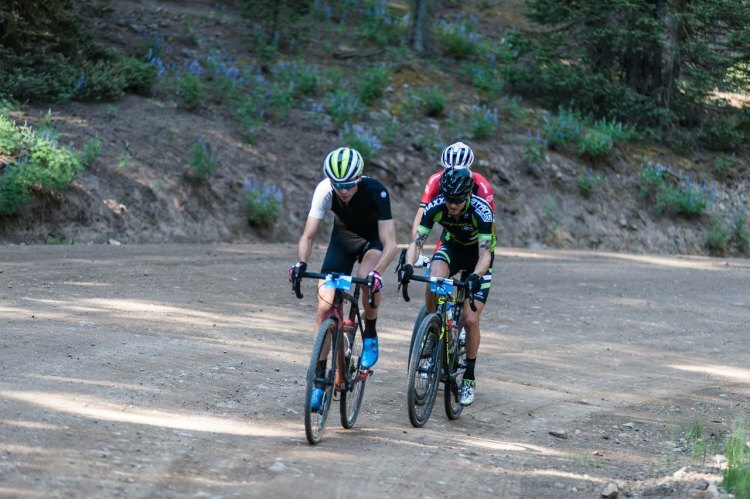 This was the first year Squire raced the Crusher with a power meter, and although he hasn’t rigorously analyzed his output, he did say he saw some big numbers, especially when he had to chase back from a front tire issue (more on that below). 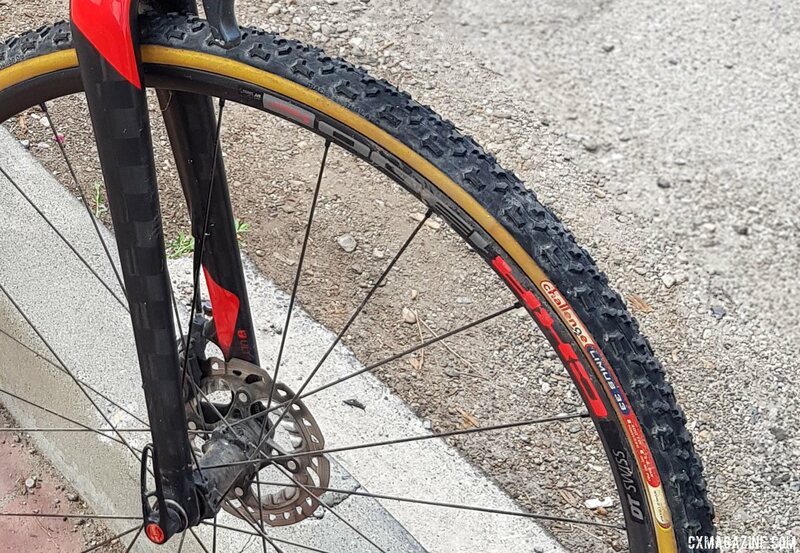 With the rough conditions on the Cul d’Crush and a roughly 60-40 gravel/pavement split, tire choice is something Crusher veterans put quite a bit of thought into. With the growth of gravel bikes, there are so many different gravel tire options, almost all of which are tubeless. However, Squire opted for bike-appropriate tires, and rode a mismatched pair of 33mm cyclocross tires. We’ve long said mud tires aren’t only useful when it’s wet and sloppy, but also when it’s dry and loose, and when the Challenge Limus was first unveiled, we noted its “deep tread” might offer “better bite when conditions get loose.” Squire seems to agree, as up front he opted for the Challenge open tubular (clincher) mud tire for cornering control. We’ve often said mud tires are great choices for loose, dry dirt and gravel. Rob Squire believes the same and opted for a Challenge Limus Open Tubular mud tread to maintain grip on the loose gravel of the 2017 Crusher in the Tushar. He set it up tubeless but at 50 psi it blew off shortly into his race. While the tread option may seem unconventional, Squire’s installation was even more so. Squire won last year riding inner tubes, but prior to the 2017 Crusher, he set up the Challenge open tubular on his DT Swiss wheels without an inner tube, hoping the handmade, non-vulcanized tire would provide a supple, flat-free ride without the weight and resistance of an inner tube. He tested the setup before the race with success, although on race day morning, pushed the tires to 50 psi, knowing he had a lot of pavement ahead. You’d think the defending two-time winner would have his race day equipment dialed well before his third attempt, but even Squire couldn’t resist making some late tweaks before his attempt at a three-peat. It’s a temptation that many of us amateurs can relate to, and a sign that even at the highest profile gravel races, it’s still an exercise in being self-sufficient—pit crews of cyclocross or follow cars of road races are nowhere to be seen. His tire setup held beautifully…for all of ten minutes. Then his front Limus blew off the rim, forcing him off the road to make a quick fix. After inserting an inner tube and reverting to the Challenge-open-tubular-with-inner-tube combination he used to win in 2016, he had a long chase back (with some assistance to Mike Pratt) to get back to the leaders. It was during this ten-minute chase Squire laid down his highest power output of the day. Thankfully, his tire choice out back, a Schwalbe X-One tubeless cyclocross tire, didn’t contribute to Squire going off the back. That tire was also set up tubeless and proved reliable and problem-free at 50 psi. Squire demonstrated that the even gravel champions don’t need gravel equipment or perfect days to still take home one of the most coveted crowns in gravel. See the full gallery of Squire’s winning ride in the photo gallery below the specs. Check out all our coverage of the 2017 Crusher in the Tushar here. Andrew Yee and Zachary Schuster contributed to this bike profile. Tires: Schwalbe X-One 33mm tubeless rear, Challenge Limus open tubular front, both set up tubeless (initially).